"Sèrvice centre steals your money"
I have owned a Toyota Tundra for 11 years (first a 2008, then a 2012). I have always had my service completed at a Toyota dealership and in various cities and towns depending where I am when in need of an oil change or scheduled service. So today was no different, I was in Grande Prairie and I needed an oil change. I headed over to the Toyota dealership and drove on in. I have never paid more than $70 for an oil change. Well imagine my surprise when I went to pay the bill and was told it was $110. When I asked about it this and explained my past cost, I was told that it must be cheaper at a major center and that their costs are higher. BS. This dealership is a rip off in the service department for sure. Buyer/user beware. I was speaking with a salesperson while my truck was in the service as I am looking to buy a new truck, but this experience of being gouged may have turned me off another Toyota all together. "Service is a rip off!! " I took my car in for a recall. Once I got there I was told that the vehicle was due for an oil change and a transmission fluid change. The lady suggested I do a complete maintenance inspection instead of an oil change. I thought that was a good idea and agreed. Now, you must know that I had a broken key with a half stuck in.the ignition. I mentioned it to her but also said not a.bog deal, I can still operate it by inserting the other half. She said the tech would look into it. I drove the car in at 7.45am hoping to have everything done soon. No communications until around noon when I texted and asked for an ETA. After half an hour I received a quote for $1540.00. No, I haven't misplaced the decimals or added extra zeros. Instead of trying to get the key out, the quote was to replace the entire ignition cylinder and whatever goes with it. I asked that work not to be done. Then the lady on phone suggested that she would get a locksmith and try to get the key out. I agreed. At this point I was also told that the serpentine belt and a leaking valve (requiring 1.5hrs of work) needed to be replaced. I agreed too. This is at 1.30pm. At 3.45 I got a text saying that the car was ready and my bill was 1500+. Well, it apparently was a misunderstanding that I authorized extra works that weren't expalined to me in terms of their cost. I was under the impression that it was going to.be under 800 as the quote given to.me in the morning. There was an 80 dollars diagnosis charge for getting the key out which the tech performed and decided he needed to order the entire cylinder assembly. Well, that was taken off reluctantly. Yes, I paid the locksmith's charge on the bill. On top of this, of you are planning to go to this dealership, you must know that the hourly rate is C$149.49/hr. Check around; the max I found was C$110.00 /hr. Next vehicle will not be a Toyota as long as I live on the same place. I have dealt with Toyota dealerships in other places and am very happy with it. 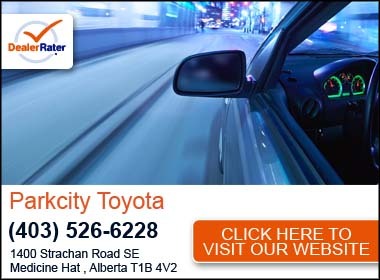 If you buy a Toyota and live anywhere in the Northern Alberta, Grande Prairie dealership is the only way unless you want to drive to Edmonton for a scheduled service. Nothing against Toyota but done with it because of this dealership after two Toyota vehicles. This is not my first unpleasant experience but is the most shocking one and for sure the last. First time Toyota buyer. Kim was great and made sure all my questions were answered so I could understand them. She even delivered my truck to me at work during a very scary lightning storm that I would have not gone out in. all staff treated me like family. I have bought 4 vehicles from Sean Sargent Toyota so far. The vehicles have always been great, never any trouble and the service team has always taken good care of our regular maintenance. Kim has been great throughout this last purchase; very responsive to questions and emails. From the moment I was greeted by Logan at the door he made the purchase of my Toyota a great experience. He listened to my needs and put me in a wonder new car. Highly recommend then entire staff. I will never go anywhere else. Excellent customer service. I have purchased two vehicles from Sean Sargent and both times it was a positive experience. Thank you to Kim Normore for above and beyond customer service. "Happy with my purchase "
I am satisfied with the quality of service i got from Chris and Brady. Both of them (Sales and Finance) were very professional and happy to answer my never ending questions. I recommend anyone interested in purchasing a Toyota to go through Chris. They made me feel at ease and earned my trust. My car was delivered to me in a timely manner. "Amazing experience for first time buyer!" Just purchased my first new car and had the best experience I could’ve hoped for. Amazing customer service, answered any and all questions as well as explain everything with high detail. Logan as well as Don were a pleasure to do business with and I would recommend Sean Sargent Toyota to any of my friends!